A Lunar Corona is not the same as a Lunar Halo. A 22 degree halo, same as with the solar halo, is seen around the moon when the upper atmosphere contains ice crystals. But sometimes much smaller coloured rings sometimes surround the moon, and these are also much closer to the moon than the halo ring. 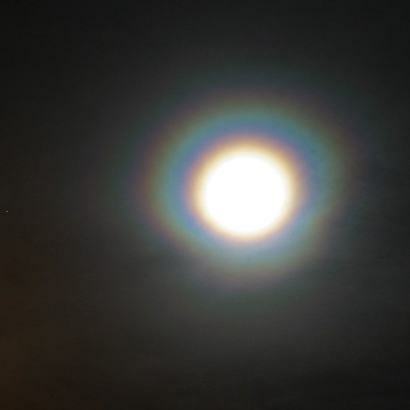 This phenomena is known as a Lunar Corona, and is produced by the diffraction of light by the water droplets of clouds, just the same way a rainbow is formed from sunshine in the daytime. This great example of a lunar corona was taken on December 8 2003 in Dundee Scotland, by Keith Edwards from the University of Dundee in Scotland.